PCN, the “Gray Sheet,” is a specialized news service that has been focusing on petrochemicals longer than any other publication. Each week, since 1963, PCN has delivered news of significance to decision makers in the industry. In PCN you will get…. Thorough coverage…. of important petrochemical news, worldwide. PCN covers new plants and plant expansions, new business ventures, corporate changes, mergers and acquisitions, new process and product developments, market forecasts, legislative actions, key personnel changes, and much more. Critical information…. that is essential in making profitable business decisions. Fast delivery…. of weekly issues via email or first class mail. Issues are sent out Friday afternoon, with no extra charge for email or air mail service, regardless of where you are located. The email edition arrives within minutes of releasing the current issue and, depending on postal service efficiency, issues mailed first class should arrive to you by Monday. Concise writing…. in a terse, fast-reading style that saves you time. PCN gives you the critical information quickly. 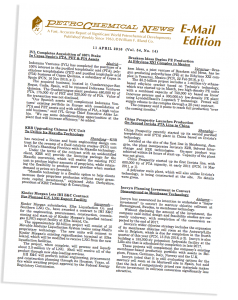 A newsletter-type publication in appearance, it is emailed in a pdf file (which allows you to print one copy) or printed on letter-size paper. Each issue is just four pages–enough to report all the news that matters. Experience…. that executives in over 45 countries rely on. PCN is an independently owned publication, founded in 1963 by William F. Bland. Mr. Bland was formerly chief editor of Petroleum Processing, engineering editor of National Petroleum News and assistant to the publisher of Platt’s Oilgram News Services and Petroleum Week. He is author of the “petrochemicals” section in McGraw-Hill’s Petroleum Products Handbook, and was the chief editor of its Petroleum Processing Handbook. And a guarantee…. that we will refund the unused portion of your subscription if you are ever dissatisfied with PCN for any reason. In PCN you WON’T get…. Please view a sample copy and let us know if you are interested in receiving a new subscription or would like a free four-week trial.